PickFu offers a range of products for your polling needs. When you’re testing three or more ideas, you can choose between PickFu Ranked and PickFu Head-to-Head. In a Ranked poll, we’ll present your ideas all at once to respondents. Each respondent will rank their favorites as #1, #2, and #3, then write a comment explaining their ranking. We’ll aggregate their votes to name an overall winner and rank the rest of the ideas. In a Head-to-Head poll, ideas are presented to respondents in head-to-head matchups, meaning two at a time. For each matchup, respondents vote on their favorite of the two options presented and provide a written comment about why they chose one over the other. Each idea is tested against every other idea in the set – sort of like how in a softball league, each team plays every other team. These paired matchups will be aggregated to reveal an overall winner and rank the rest of the set. Both the Head-to-Head and Ranked polls can test up to 8 ideas. However, the manner in which each poll is conducted is different: a Ranked poll uses what’s called instant runoff voting, and a Head-to-Head poll uses what’s called pairwise comparisons in a round-robin format. The Ranked poll will generally take less time to complete and cost fewer credits, depending on your targeting criteria. The Head-to-Head poll will be more comprehensive, providing more written feedback. Here is a real-world example of both Ranked and Head-to-Head results for a watch brand researching which color watchbands were most popular. Click the links below to see full results and read written comments. • The Ranked poll took 20 minutes to complete, cost 20 credits, and included 50 written comments. • The Head-to-Head poll took 46 minutes to complete, cost 60 credits, and included 300 written comments. In this case, the Head-to-Head poll ranked the ideas in this order: A, C, D, B, with A named the winner. The Ranked poll ranked the ideas in this order: A, D, C, B, with A named the winner. Because the respondents are unique and the scores are calculated differently, the results of each type of poll will not always be the same. In this case, however, the winner was the same in both polls, with variances only in the second and third most preferred color. 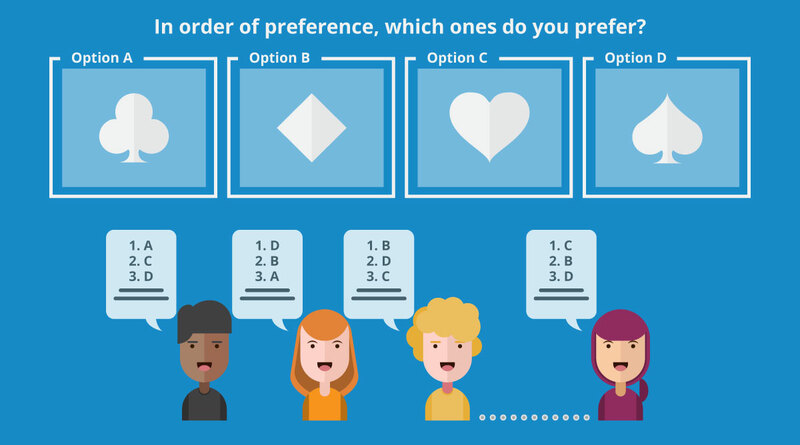 Whichever poll you choose, PickFu is the fastest and easiest way to get customer feedback. It only takes a minute to set up your poll. Try it now!